On the 12th December, Ascensia (formerly Bayer) announced an improved version of the Contour Next One App which accompanies the Contour Next One glucose meter. I spoke with Joseph Delahunty, Global Head of Communications just before Christmas where he explained the new features. I did a trial with the Contour Next One blood glucose meter and app back in December 2016 and this is my review of the product back then. One of the new features that I am pleased with is the “Data Export” to any software programme feature. This means that you can upload to the software programmes that you’re other diabetes devices us. Another is the "Text Reminders". The feature that Ascensia is most excited by is the “My Patterns” feature which notifies and prompts you of the patterns it has identified and then makes suggestions to you on how to address those patterns. As an insulin pump user, the app doesn’t work for me because I can’t input exact insulin doses to 2 decimal places. However, if anyone out there would like to try this meter and app and would like to write a review I would love to hear from you. Here is the Ascensia Press Release detailing the new features. There are links to find out more about the meter and app at the very bottom. Newbury, United Kingdom, 12th December, 2017 - Today, Ascensia Diabetes Care has announced the launch of its upgraded version of the CONTOUR®DIABETES app in the United Kingdom and Ireland. It includes the new My Patterns feature, which can more intelligently analyse blood glucose results received from the CONTOUR®NEXT ONE meter, providing personalised meaningful feedback to help improve diabetes self-management for patients. This new release will be available from today in the Apple App Store (iOS) and Google Play (Android). The CONTOUR®DIABETES app seamlessly connects to the CONTOUR®NEXT ONE blood glucose meter. The My Patterns feature on the upgraded CONTOUR®DIABETES app analyses data received from the meter to identify and notify the user of sub-optimal patterns in their blood glucose readings. Once it has notified the user that a pattern has been identified, the CONTOUR®DIABETES app will prompt users about the possible causes of the pattern and provide guidance to help address it. It allows patients to set reminders or use testing plans to help improve their sub-optimal blood glucose patterns, and will track their progress to see if the pattern improves over time. The latest version of the app includes the ability to recognise 14 different patterns and includes 11 different structured testing plans. The app will continue to evolve in the future to include additional patterns and testing plans, as well as adding new features and functionality. The My Patterns feature of the CONTOUR®DIABETES app is designed to support the user in these three areas and support more effective self-management, enabled by technology. Heather Daly, Independent Nurse Consultant, commented: “Self-management is critical in diabetes. 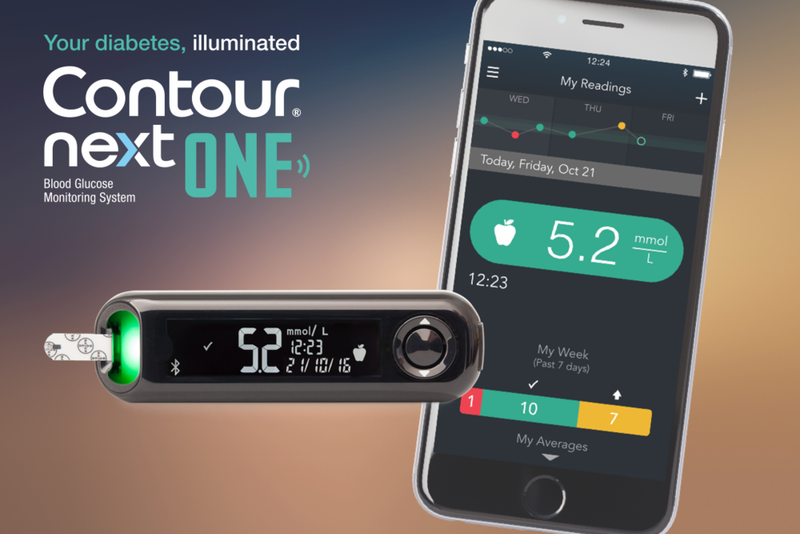 The CONTOUR®NEXT ONE blood glucose monitoring system has remarkable accuracy and published study data has shown that it exceeds the EN ISO 15197:2015 accuracy criteria in both the laboratory and clinical setting. The study showed that 95% of results were within ±0.47 mmol/L or ±8.4% of the laboratory reference values for glucose concentrations <5.55 mmol/L or ≥ 5.55 mmol/L respectively, when tested via subject obtained fingerstick. For more information, visit www.contournextone.co.uk (UK) and www.contournextone.ie (Republic of Ireland).